It’s in line with our goals to provide our traders with a range of secure, prompt and convenient Win Options banking methods. As a testament, we are constantly working to evolve our banking system so our traders can spend less time at the funding process and have more time to trade hot assets. With this, WinOptions introduces a unique electronic payment service that will make your online payments simpler, faster and safer – introducing WinOptions Ukash. Ukash has been moving money digitally since its inception. Unlike other payment service providers online, Ukash is electronic money. Its popularity has spread throughout the world because it’s so easy and convenient to use. Through a unique 19-digit code, consumers can easily and safely move their money without disclosing their personal financial details. Every Ukash code is unique, so if you’re not sure how much to get, you’ll receive any change as a new Ukash code and you can use it for future purchases. Its uniqueness has revolutionized the online digital payment world, giving you a smooth and totally secured banking experience. Use your WinOptions Ukash code to deposit funds to your trading account. Purchase your unique 19-digit code at any shops, petrol stations, ATMs, kiosks and online. For your convenience, you can use their store locator to find your nearest outlet. Simply exchange your cash for a unique Ukash code and you’re ready. Afterwards, access your WinOptions trading account and click on the ‘My Account’ link. Choose Ukash as your payment method and type in the 19-digit code on the space provided. Just wait for a few minutes and the funds will be visible in your trading account. 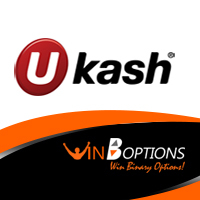 WinOptions Ukash is perfect if you don’t have a credit/debit card or don’t want to use your card to transfer money to your trading account. What’s more, it keeps your financial information safe and private at all times. It’s also available in our WinOptions mobile application, you can browse all your transactions on a smartphone or tablet.